And so ends a rather very disappointing anime adaptation, although it was hella fun to both watch and work on it. Also, huge thanks to Vivid for jointing with us and making this project even possible! Batch and staff credits sometime this week. That staff list might not be completely final and I kinda dislike putting the staff credits both on this and the batch post. This show was a lot of work to edit, but I had fun and it was great working with the guys from Asenshi. I didn’t even hate the adaptation, really, though it probably helped that I went into it with no expectations. Here’s to an excellent joint project. Yeah. I know that the manga readers didn’t think much of this anime, especially having an original ending, but being someone who hasn’t read the manga at all I very much enjoyed this series as it was. Actually, manga ending will be only expanded version of anime… it’s already confirmed by author, huh. And your release pic just made me notice something. Who the hell is in Incursio? 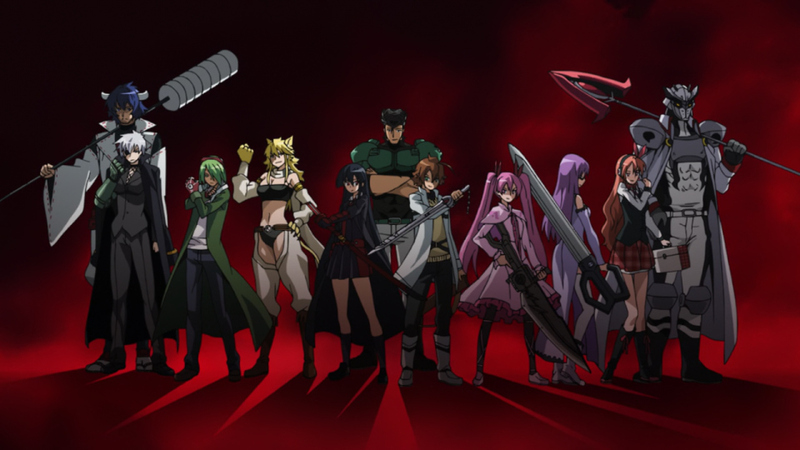 Bulat and Tatsumi are standing in the middle of the picture. Pardon, if my grammar may bother you (since I’m not a native speaker + my conversation skill is kinda rusty). I just want to thank you for nice crunchyedit. Although adaption has some flaws, it was rather entertaining show and your effort made it far more enjoyable. PS: I hope you will do DRR and/or DxD. Hey Asenshi, could i have updated subs for Rozen Maiden? 720p?